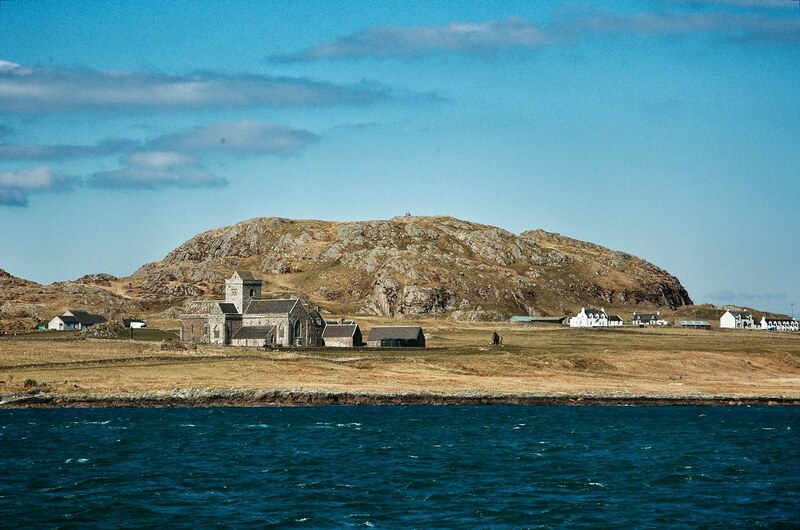 Iona's place in religious history was guaranteed when St Columba arrived with his 12 disciples and founded a monastery there in 563 AD. The Irish monk then set about converting practically all of pagan Scotland and much of northern England. 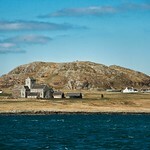 Iona went on to become the most sacred religious site in Europe and has been a place of pilgrimage for several centuries. Today that pilgrimage has turned into more of an invasion, with hordes of daytrippers making the five-minute ferry trip from Mull to visit the abbey. Few, however, venture beyond the main village, Baile Mór, and it's easy to find a quiet spot, particularly on the west coast with its sparkling silver beaches washed by turquoise sea. 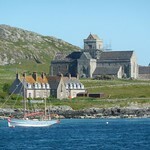 It's worth spending a day or two here to soak up the island's unique spiritual peace, so well conveyed in the words of Dr Johnson: "that man is little to be envied whose…piety would not grow warmer among the ruins of Iona". 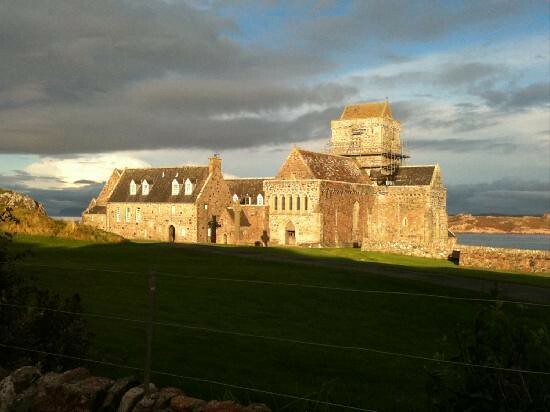 Iona is known as the 'Cradle of Christianity in Scotland', and was a centre of the arts. The monks produced elaborate carvings, manuscripts, ornate gravestones and Celtic crosses. Their greatest work was the beautiful Book of Kells, which dates from AD 800, and which is now on display in Dublin's Trinity College. This proved to be the high point of the church's history. Shortly after came the first of the Viking raids, in AD 806, when many monks were slaughtered at Martyrs' Bay, followed by another in AD 986 which destroyed the work of many years. The relentless pressure from the established church ended with the suppression of the Celtic Church by King David in 1144. 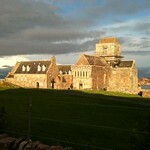 In 1203 Iona became part of the mainstream church with the establishment of a nunnery for the Order of the Black Nuns, as well as a Benedictine Abbey by Reginald of the MacDonalds of the Isles. 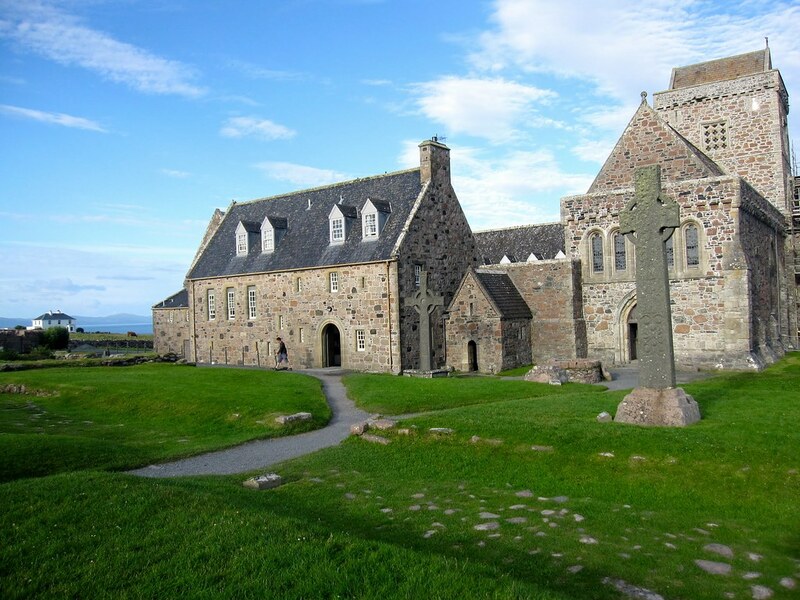 Iona became overshadowed by the royal city of Dunfermline, and its final demise came with the Reformation when buildings were demolished and all but three of the 360 carved crosses destroyed. The abbey lay in ruins until in 1899 the island's owner, the eighth Duke of Argyll, donated the buildings to the Church of Scotland on condition that the abbey church was restored for worship. 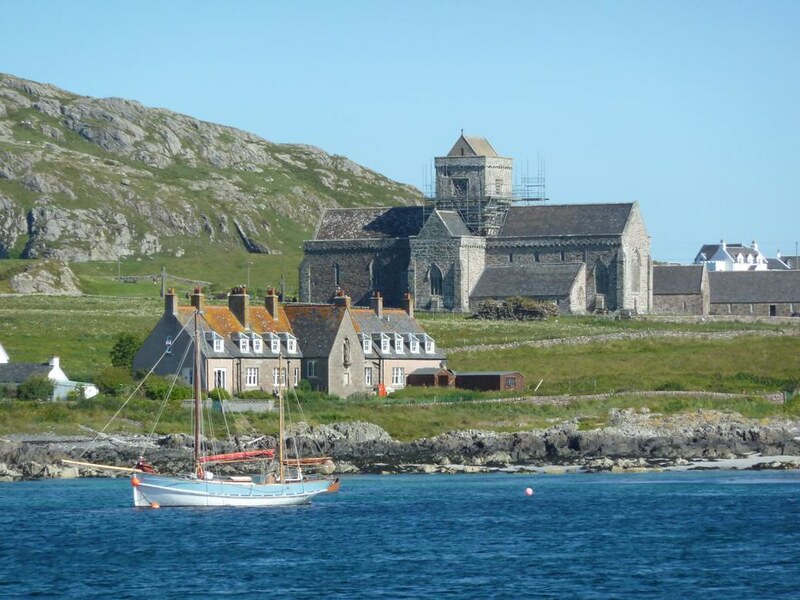 Then in 1938 the Reverend George Macleod founded the Iona Community as an evangelical Church of Scotland brotherhood, with the abbey buildings as its headquarters, and by 1965 had succeeded in rebuilding the remainder of the monastic buildings. 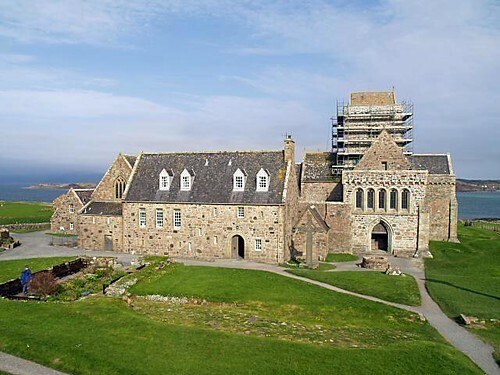 Now the abbey complex has been completely restored and the island of Iona, apart from the abbey buildings, is owned by the National Trust for Scotland. 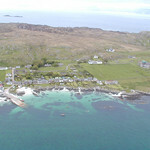 A passenger-only ferry leaves from Fionnphort, Mull (5 mins) frequently 0845-1815 Mon-Sat and hourly 0900-1800 Sun. Iona is small enough to get around easily on foot, or you can hire mountain bikes at Finlay Ross (Iona) Ltd, in Baile Mór village, Tel. 700357. On the west coast are some lovely beaches of white sand and colourful pebbles. The best of the lot is the Bay at the Back of the Ocean, beside the golf course, and only a mile and a half walk from the ferry. This was one of John Smith's favourite places and it's easy to see why. At the southern tip of the island is another sandy beach at St Columba's Bay, believed to be the spot where the saint first landed. The small cairns here are said to have been built by the monks as penance for their sins (they obviously had a lot on their conscience). You can also seek answers to difficult questions by walking round the labyrinth, whose twisting route makes use of your left and right brain and makes you think. Around the corner, at Rubha na Carraig-géire on the southeastern tip, is the marble quarry, disused since 1915. The rusting remains of the cutting equipment are still lying around. Another good walk is to the top of Dun I, the only real hill, which rises to a height of 300 ft.To get there, continue on the road north from the abbey, past MacDougal's Cross, then go through a gate to the right of Bishop's Walk Farm and follow the fence up to where you join a footpath up to the top. It's only about half an hour up and down and there are great views from the top of the entire island and the coastline of Mull. 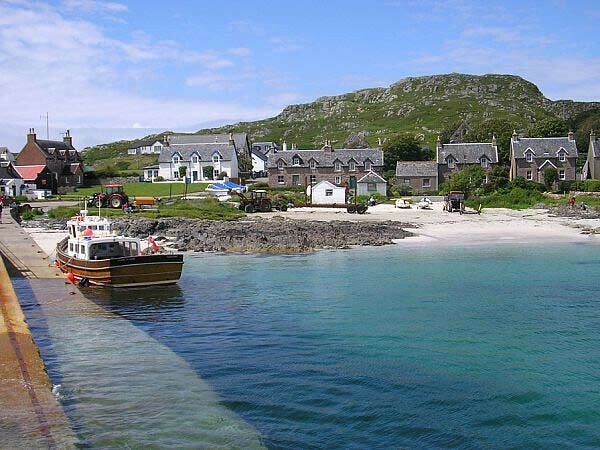 The passenger ferry from Fionnphort on Mull lands at Baile Mór, Iona's main village, which is little more than a row of cottages facing the sea. 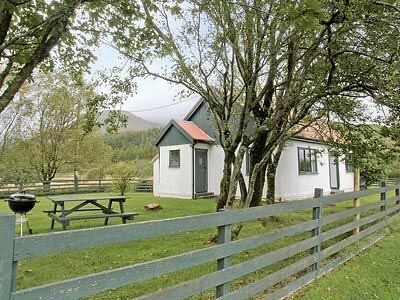 There are over a dozen places to stay but, as demand far exceeds supply during the busy summer season, it's best to book in advance at one of the tourist offices on Mull, or in Oban. There's also a post office, a very good craft shop and general store in the village. Just outside the village, on the way to the abbey, are the ruins of the Augustinian nunnery. 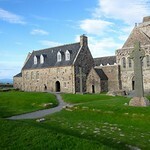 Just to the north, housed in the parish church manse, built by Thomas Telford, is the Iona Heritage Centre, which features displays on the island's social history. Info - Apr-Oct Mon-Sat 1030-1630. Adult £1.50, which features displays on the island's social history. Nearby stands the intricately carved 15th-century Maclean's Cross. There are 15 B&Bs on the island; ask at the post office for a full list. Argyll Hotel, Tel. 700334, Fax. 700510, 17 rooms, open Apr-Oct. This is the better of the island's 2 upmarket hotels, and its very good restaurant serves cheap lunches and mid-range-expensive 4-course dinners. 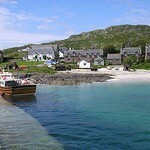 Among the island's B&Bs is Iona Cottage, Tel. 700579, open year round. 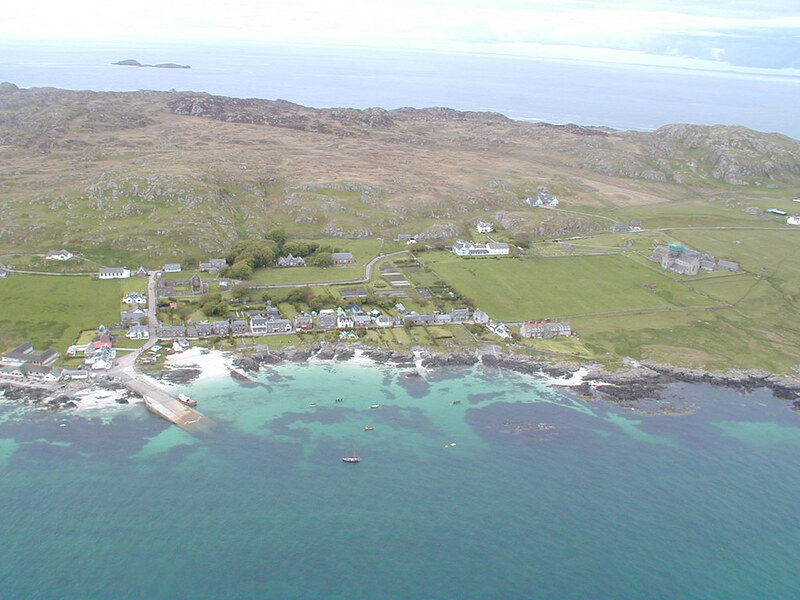 It's worth the walk down to The Iona Hostel, Tel. 700642, an exceptional hostel with views to the Treshnish Islands about a mile from the ferry along the path past the abbey. It's best to book ahead in summer. Apart from the Argyll Hotel, there's the Martyrs' Bay Restaurant, which serves soup and snacks.